On October 18, environmental activist Le Dinh Luong's 20-year sentence was upheld on appeal. He reportedly told the court: "My deeds will be judged by history. I will be happy to be in prison if the nation grows up in freedom and democracy." Le Dinh Luong's son, Le Dinh Hieu, was attacked by police, and his daughter-in-law, Nguyen Thi Xoan, taken into custody for hours, just days after Mr. Luong’s arrest. In August 2017, police attacked fifteen relatives of Le Dinh Luong when they came to try to meet with Luong and to learn more about his current situation. Police initially took the family members, including pregnant women and elderly family members, in to the station and then beat them and detained part of the group. Arrested July 24, 2017. Sentenced to 20 years in prison under Art. 79 (1999 Code). Expected Release is July 24, 2037. Veteran Le Dinh Luong was taken into custody by plainclothes police on July 24, 2017, in Nghe An province, for alleged subversion under Article 79 of the 1999 Criminal Code. He has written on the Formosa environmental disaster and has been targeted by authorities for calling for an election boycott and for connections to Viet Tan, an overseas pro-democracy group. Activist and veteran Le Dinh Luong was originally scheduled to be tried on July 30. 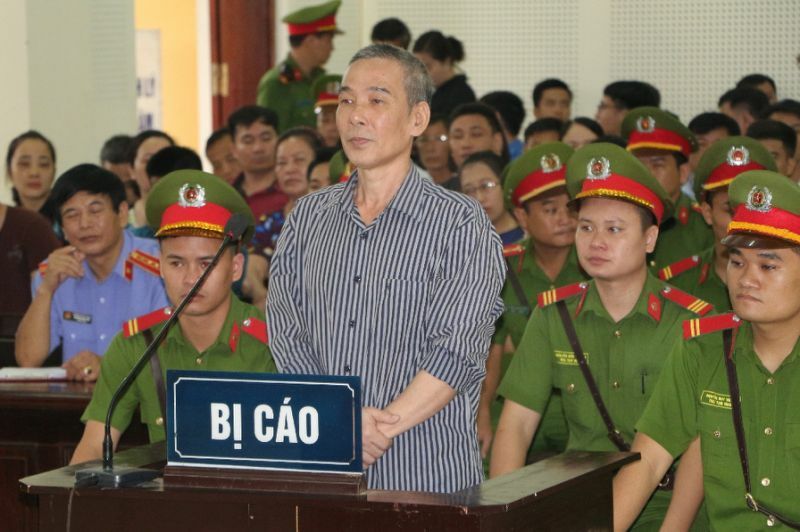 However, his lawyer Ha Huy Son announced on July 27 that the trial has been postponed; reasons were unclear, however Luong's other lawyer, Dang Dinh Manh, was travelling outside of Vietnam. Le Dinh Luong was tried on August 16 in Nghe An province and sentenced to an astounding 20 years in prison. A veteran, Luong was sentenced under charges of subversion for peacefully advocating for a clean environment and multi-party democracy. Luong's lawyer, Ha Huy Son, says Luong will appeal the verdict. After the trial, the US State Department said it was "deeply concerned," and urged Vietnam to bring its laws into line with international human rights obligations. Amnesty International had expressed worries prior to the hearing that Luong would not receive a fair trial. He was finally allowed to meet with his lawyers in late July, after a year of incommunicado detention. After the trial, news surfaced that journalist Nguyen Van Hoa was beaten and forced into giving testimony used against Le Dinh Luong in court. The Committee to Protect Journalists reported the news. Hoa later recanted on the witness stand, saying the statements were made under duress of the assault. Luong, however, was still sentenced to 20 years in prison. Both activists had been involved with activism after the Formosa environmental disaster. There is also a report that imprisoned founder of the Vietnam Republic Party, Nguyen Viet Dung, was coerced into giving false testimony as well, which he also later recanted, separately from Hoa. Luong's lawyers were not allowed to meet with either witness. After Dung recanted, his family was denied a visit with him in prison. On October 18, Le Dinh Luong's 20-year sentence was upheld on appeal. He reportedly told the court: "My deeds will be judged by history. I will be happy to be in prison if the nation grows up in freedom and democracy." Le Dinh Luong was one of several activists attacked by plainclothes police and unidentified persons in August 2015 after attending the celebration of recently-released political prisoner Tran Minh Nhat. Human Rights Watch called for his release ahead of the previously-scheduled trial, noting that Luong has been denied due process, lacking a lawyer for almost the entire first year of his detention. In response to Vietnam's Universal Periodic Review in front of the UN Human Rights Council in January, Human Rights Watch (HR) has said that "Vietnam presented a grossly inaccurate picture of its human rights record." While publicly committing to the right to a defense counsel, HRW contends that in practice, many dissident defendants are represented by counsel that has little time to prepare for their case, and many trials are rushed. They also highlighted the case of Le Dinh Luong, who was denied the right to meet with his defense counsel (which is allowable under Vietnamese law for national security charges) until the month before his trial; he was later sentenced to 20 years in prison.